As we anxiously await the release of the House Transportation & Infrastructure’s version of the surface transportation reauthorization, Chairman John Mica took the time to answer a few questions about his vision to reduce red tape and get people and goods moving in Southern California. M 21: How will your transportation bill benefit Southern California, which has significant urban congestion and goods movement challenges? CM: Most importantly, this proposal will provide long-term stability for states to plan major infrastructure improvements. When federal transportation programs are funded for short periods of time, such as a few months or even one to two years, states are unable to rely on a steady source of funds for long periods of time. This makes it nearly impossible to plan and undertake large transportation projects that both provide much-needed infrastructure improvements as well as long-term construction jobs. A five-year bill will provide this essential stability that allows states like California to move forward with significant projects to address growing congestion and freight mobility. This proposal will also benefit heavily congested areas like Southern California by reducing the federal bureaucracy and red tape involved in moving a project forward, and providing more flexibility to states to determine their most critical infrastructure needs. By reducing the costly bureaucracy and trimming the amount of money it takes to operate over 100 federal surface transportation programs, more of the gas taxes Californians pay at the pump will be returned to the state to be dedicated to infrastructure improvements. And by streamlining the project approval process, projects to reduce congestion can proceed in an expedited fashion. M 21: So much news from D.C. is about partisan gridlock. What are some of the areas of strongest bipartisan and bicameral agreement on transportation policy in Washington, D.C.? CM: Republicans and Democrats in the House and Senate share many of the same goals for this legislation. 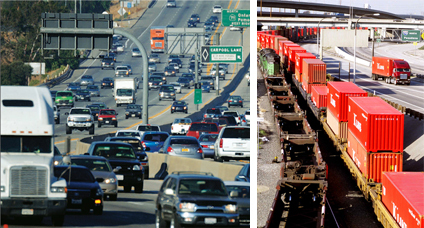 Reducing the amount of red tape required to approve transportation projects, consolidating and eliminating many of the duplicative and unnecessary transportation programs and increasing the use of programs – such as the TIFIA (the Transportation Infrastructure Finance and Innovation Act) program – that allow federal resources to be more effectively leveraged with private sector and other resources are areas in which members of both parties have found common ground. M 21: Describe some specific ways your transportation legislation will reduce costly delays to transportation projects? CM: According to the Federal Highway Administration, highway projects can take up to 15 years to complete. While state and local governments deal with the seemingly endless review process, transportation capacity and safety improvements stall, construction costs escalate and job creation remains on hold. Project reviews are necessary to help protect the environment, but a more reasonable process is essential to using our resources more effectively. It can be done. For example, when a design flaw caused the collapse of the I-35W bridge in Minnesota in 2007, the replacement was contracted to be completed in just 437 days and was completed significantly ahead of schedule using innovative contracting methods and a streamlined environmental review process. The House proposal will streamline and condense the project review process by cutting bureaucratic red tape, allowing federal agencies to review transportation projects concurrently, setting hard deadlines for federal agencies to approve projects and delegating more decision making authority to states. We can ensure environmental protections remain in place but by cutting the project review process time in half, we can limit project cost escalations caused by delays and invest our infrastructure resources in a much more effective manner. M 21: What can Southern California residents do to have their voice heard on your transportation bill? CM: By contacting Members of Congress and the Senate and urging the completion of action on a long-term transportation bill that streamlines federal programs, cuts red tape and effectively utilizes our federal resources, residents of Southern California can help ensure this critical legislation to reduce congestion, improve our transportation systems and create jobs moves forward. Mobility 21 advocacy helped ensure the legislature ratified the passage of California’s gas tax swap and the governor’s truck weight fee proposal. This prevented the loss of $2.5 billion in funding for critical state, regional and local transportation projects, and gave $1 billion in relief to the general fund while helping to create or save 63,000 jobs. Mobility 21 pushed hard to save California’s fall bond sale to protect thousands of good-paying jobs and save millions of taxpayer dollars. Mobility 21 worked to educate elected leaders on the importance of investing in Southern California’s goods movement projects as a means to secure our nation’s prosperous future. 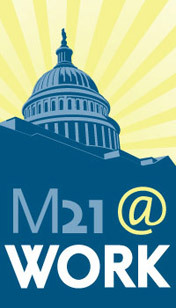 Mobility 21 fought for transportation funding during the State budget negotiations. Mobility 21 supported confirmation of key Southern California transportation leaders Fran Inman and Yvonne Burke to the California Transportation Commission. Mobility 21’s Annual Transportation Summit drew a record turnout with over 1,000 transportation leaders and professionals at the JW Marriott at L.A. Live on Sept. 6. Mobility 21 advocacy resulted in several key policy points being included in Senator Barbara Boxer’s two-year surface transportation bill, MAP-21. Namely, elements of America Fast Forward, Breaking Down Barriers and a new national freight policy found their way into the bill. 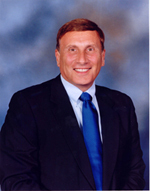 Mobility 21 strongly supported Chairman of the House Transportation & Infrastructure Committee John Mica’s announcement that he will seek additional Highway Trust Fund revenue sufficient to maintain current funding levels for our nation’s highway and transit programs. Mobility 21 advocated effectively for federal TIGER III grants, resulting in $37 million for the SR-91 in Riverside County and rail enhancements at the Port of Long Beach. Mobility 21 supported Sen. Lautenberg’s successful substitute for S. 1950 (Commercial Motor Vehicle Safety Enhancement Act of 2011) and Sen. Cantwell’s Amendment 1 to that substitute to include planning and resources for freight movement in the next surface transportation bill. Mobility 21 has actively pushed for the expansion of the TIFIA program which has been touted by the chairs of both House and Senate committees as an effective tool for leveraging scarce federal dollars. The 11th Southern California Transportation Summit will be held on Friday, Sept. 28 at the Disneyland Hotel in Anaheim. As planning for the annual event kicks off in early 2012, those interested in joining the lineup of speakers are invited to e-mail discussion topics and white papers to Kristin Slocum, communications manager. Sponsorship opportunities for the 2012 Summit will be released to last year’s sponsors in January and will open to new sponsors in March. Two transportation improvement projects received a boost from the federal government with the U.S. Department of Transportation’s (DOT) recent funding award to the State Route 91 (SR-91) improvement project in Riverside County and the Port of Long Beach’s rail realignment project. Through the third round of the federal grant program known as the Transportation Investment Generating Economic Recovery, or TIGER III, federal officials awarded $510 million for grants across the nation. A scarcity of funding for transportation, particularly at the federal level, made the TIGER grant program highly competitive this year. Of the 848 applications DOT officials reviewed, only 46 received grants. While counties across the nation have opted to tax themselves to help pay for transportation improvements, local dollars do not always fully cover the cost to pay for major construction projects. According to the Southern California Association of Governments’ draft Regional Transportation Plan, the transportation funding breakdown in our region looks like this: 11 percent comes from the federal government, 15 percent is state-funded and 74 percent of the money for Southern California’s transportation projects is raised locally through sales tax measures. The Riverside County Transportation Commission (RCTC) was awarded a $20 million Transportation Infrastructure Finance and Innovation Act (TIFIA) subsidy payment through the TIGER III grant program for the SR-91 Corridor Improvement Project. The $1.3 billion project, which focuses on reducing congestion on one of the most heavily traveled freeways in Southern California, plays a pivotal role in the region’s goods movement network. The project will extend the 91 Express Lanes from the Orange County border into Riverside County and add a lane in each direction. The Port of Long Beach received a $17 million grant for its Major Rail Realignment at Ocean Boulevard Project. As part of the larger San Pedro Bay Ports Rail Enhancement Program with the Ports of Los Angeles and the Alameda Corridor Transportation Authority, this project will create 340 full-time jobs, enhance both our region’s and nation’s long-term economic competitiveness and increase the safety, environmental sustainability and livability of the region. At Mobility 21’s 2010 Summit at the Disneyland Hotel, lunchtime presenters Dustin McBride and Vaughn Spethmann inspired conference attendees with their passion for helping others. Their organization,a.ker.fa, nurtures the Zambian-led company, Zambikes, which provides affordable and dependable transportation resources to the developing world. Last week, Mobility 21 urged members of the Senate Committee on Commerce, Science and Transportation to approve Sen. Lautenberg’s substitute for S. 1950 (Commercial Motor Vehicle Safety Enhancement Act of 2011) and Sen. Cantwell’s Amendment 1 to that substitute. These pieces of legislation, which could ultimately be merged with the two-year transportation bill passed by the Senate, are essential to provide the planning and resources necessary to improve and maintain our nation’s freight network. Under the substitution, a National Freight Infrastructure Grants program would be established. The program would be funded by new revenues and structured as a merit-based, competitive grant program, designed to focus funds where they will provide the most public benefit. The committee voted to approve Sen. Lautenberg’s substitute for S. 1950 and Sen. Cantwell’s amendment, supporting a systemwide approach to the infrastructure that carries our goods and providing long-term economic stability to the country. Earlier this month, Mobility 21 issued a warning to the organizers of the “West Coast Port Shutdown,” an offshoot of the Occupy Wall Street movement, that an interruption at the ports could do more harm than good — hurting the workers they were trying to help. On the morning of Monday, Dec. 12, a group of 200-300 demonstrators marched from the Queen Mary to the south gate of the Port of Long Beach’s Pacific Container Terminal, which is operated by SSA Marine and COSCO. As they rallied at the back gate between 5:30 and 9:30 a.m., trucks entering the port were diverted to the north gate. Fortunately, the Port of Long Beach reported little interruption, but it’s threats like this to the heart of our region’s economy that remind us of the significance of goods movement. If the magnitude of the protest had been expanded, a day-long shutdown at the ports could be devastating to workers and businesses who rely on efficient transportation of goods at the ports. The International Longshore and Warehouse Union, which is the largest workforce within the ports, did not officially supported the group and may have had to work overtime to make up for lost time, costing the terminals more money. Truck drivers, who are paid by the load, would probably be the most negatively impacted. There are approximately 5,000 truck drivers a day working at the ports and depending on how many loads they miss, thousands of dollars in wages could be lost. More than $325 billion worth of goods come through the ports, supporting about 800,000 jobs in California. A shutdown at the ports for a day would have a ripple effect on the millions of jobs it supports nationwide. If importers sense significant labor unrest on the West Coast, it is more likely that the Ports of Los Angeles and Long Beach will lose business to the East Coast. But it’s not just about the jobs here in Southern California. Our region’s ports move nearly 50 percent of the nation’s imported cargo, which impacts 3.4 million jobs nationwide. At a time when our local and national economies continue to struggle, our workers can’t afford a shutdown at the ports. Find your U.S. Representative on the right side of our website. Urge your legislator to pass a robust, long-term transportation bill that addresses the importance of goods movement investment. For more message points, see our brochure on goods movement and our fact sheet on why a federal investment in transportation is so important. 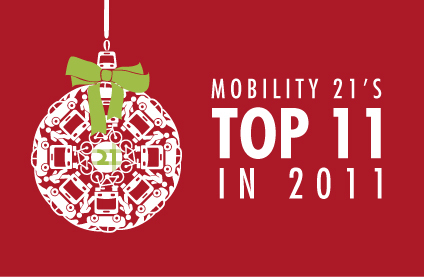 Join us by signing up to receive Mobility 21 e-mails at the top right of our webpage. We’ll let you know when we need you to urgently send an email or make a phone call to your representative. The public is invited to join the Anaheim Transportation Network Board of Directors at a hearing to consider service expansion and new fare media for the Anaheim Resort Transit system. 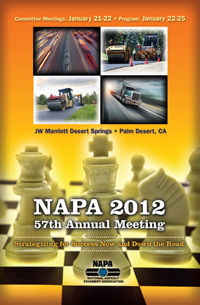 Mark your calendar for NAPA’s 57th Annual Meeting in Palm Desert, Calif. Power-packed plenary sessions, cutting-edge educational workshops and networking opportunities will combine for a dynamic event. Over the past 12 years, the California Maritime Leadership Symposium has become one of the premier events focused on briefing Sacramento’s policymakers on key matters related to the entire Maritime Transportation System. It is the only comprehensive forum for port executives, commissioners and other stakeholders across the state to seek resolution to the growing challenges the Maritime Transportation System faces. This workshop will encompass many new and information-packed sessions and round table discussions. An afternoon will be dedicated to breakout sessions with hands-on demonstrations of materials testing, test equipment, test result analysis and correct sampling procedures for materials (liquids/aggregates) used everyday in the treatments that professionals depend and rely on to keep roads in good shape. 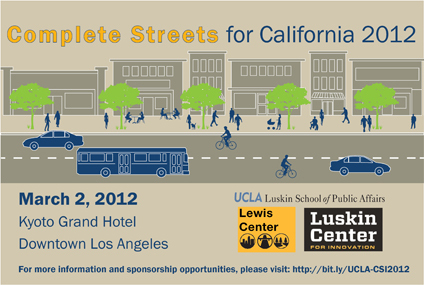 The second annual UCLA Complete Streets conference will look back at past accomplishments and will concretely analyze the most recent evolution of complete streets through research and examples of implementation. Streets play a critical role in creating a more vibrant, productive and sustainable California. However, despite the benefits of complete streets, challenges still remain as many of the roles of streets are often competing. This gathering of interdisciplinary professionals, faculty and students will discuss safety, multi-modality and a holistic approach to streets.